Commercially-produced wildflower seed mixes are readily available and broadly used for attracting pollinators and adding beauty to small gardens and landscapes. These mixtures are popular with landowners because they are pre-mixed and eliminate the guesswork of designing custom mixtures. They also eliminate the need to search for and purchase individual species from multiple vendors to create a seed mix. The species in the mixtures are selected for their attractiveness to bees, butterflies, and other pollinators and are purportedly well adapted to specific regions or environments. Despite these advantages, suitability of many of the species in the mixes to pollinator plantings for CRP or other NRCS programs is largely unknown. Many species are from North America outside of the target region; others are of Eurasian or African origin. Additionally, some commercial mixes may contain plant species that can become invasive, or the mix may not contain appropriate species to provide pollinator forage throughout the year. The mix may also contain plant species that are attractive to humans but provide little value to the pollinators. 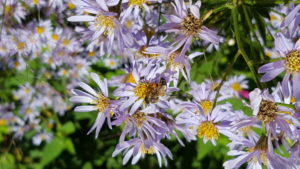 Establishment, persistence, and suitability of many of these species to pollinator plantings are poorly understood in this context, and these issues need to be examined before NRCS can recommend commercially designed seed mixes for conservation practices.